On December 16, 1779, Agnes Mathieu, my 4th generation-great grandmother, with the assistance of her French consort, Mathieu Devaux dit Platillo, was granted her freedom. This portion of the document shown here is part of an 8-page record detailing the necessary action taken to secure freedom from her previous owner. Not until the Spanish Colonial Governor of Louisiana, Bernardo de Galvez signed this document was Agnes’ freedom finally acheived. 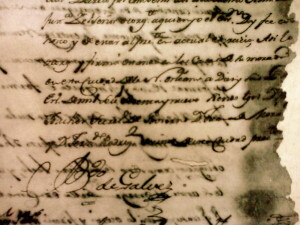 I invite you to view if you haven’t already, the PBS program, “History Detectives” segment titled “The Galvez Papers“. It is my sincere hope that this research, documentation, and amazing story continue to inspire you as you continue your journey of discovering your ancestors’ stories. My family and I, as descendants of Agnes, stand today as living memorials to the memory of her achievements. We mark this day, 16 Dec 2016 as the 236th anniversary of freedom from slavery for Agnes Mathieu. See a recent interview at “The Writing Well“. If you wish to order a signed copy of my book, Got Proof! My Genealogical Journey through the Use of Documentation, please click here .